Iron and Steel Industry – supplier of electric overhead traveling (EOT) cranes and material handling and MRO parts including brakes, friction wear, motors, etc. 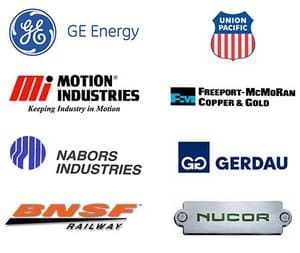 Railroad Industry – high quality products for both the freight and passenger railroad industry. Springs, Wheel Chocks, Seals, etc. Agriculture and Farming Industry – off-road equipment and brakes supplier. Mining – our custom designed brakes are used in harsh mining environments around the world in various applications and specifications. Motors, Motor Controls, Clutches, Couplings, etc. For more information, Contact a Kor-Pak representative today.